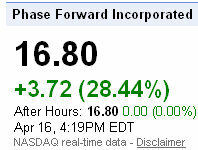 Phase Forward Inc. (NASDAQ:PFWD) shares have rocketed ahead over 28% in Friday morning’s session on the NASDAQ. The surge in Phase Forward stock price can be attributed to the new that the company is about to be acquired by enterprise software developer Oracle Corp (NASDAQ:ORCL). PFWD shares, which closed Thursday’s regular trading at $13.08, touched a pre-market high of $16.90 on Friday. Upon opening for regular trade, the stock jumped to $16.86, the highest the stock has reached in the year-to-date period, and is retaining the same levels. Stock volume has increased to 23.35 million, compared to the three-month average volume of 666 thousand.